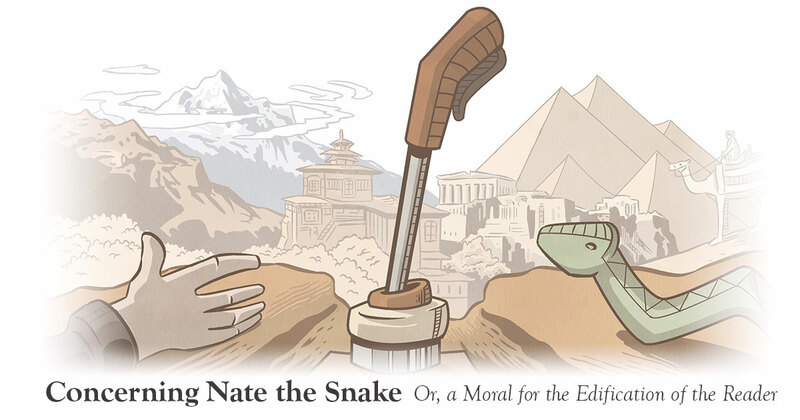 Today’s sonnet won’t make sense unless you read The Epic Tragedie of Nate the Snake. Granted, it may not make much sense even if you have read it. Both of these poems are being posted entirely for my own gratification and entertainment. They’re largely products of my training in English Lit. Nate the Snake is a heroic epic—my tribute to a dumb joke I heard multiple times, and only got more ridiculous in the retelling. Today we have the poetic apology; a mock justification of my mock epic. Are these poems as exciting to anyone else besides me? Eh, maybe not. But I have to display my cheesy side every once in a while. Don’t worry. I’ll be back to serious sonnets next week. With each new telling, with each passing time. It shouldn’t be consistent. Shouldn’t rhyme. The audience to further joy and tears. Each woman’s heart will learn it through the years. They’re really telling how their life will end.